The sense of humor of our founder, Leslie Whims, still prevails today. With 22 team members we never run out of bad jokes, terrible trivia, or funny stories. You won’t find a boring insurance person in our office but don’t let the sense of humor fool you, we know our stuff and commit every day to learn more, be better, and excel always. Our knowledge and experience sets us apart and we don’t just replicate someone else’s work – we learn about you and your needs and give you the best possible options while being completely transparent about those pesky exclusions and conditions. And we put it in writing, every year, as our pledge to you. This is a pledge we have made since Whims Insurance Agency was founded in April 1917 by a local entrepreneur, named Leslie L. Whims. 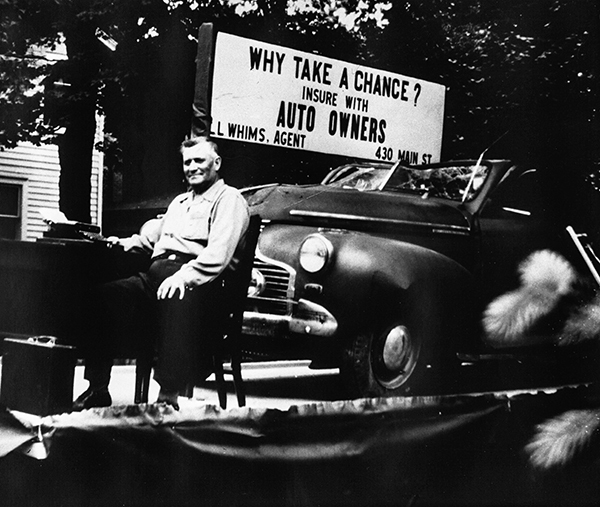 Leslie was a car dealer in Rochester when he was approached by, and licensed as an agent with, Auto-Owners Insurance Company - a partnership that still exists today. Leslie’s son-in-law, Herm Klix, joined the agency in 1963 and Herm’s son, Tom, came aboard in April 1976, after graduating from Hillsdale College. Tom persuaded his sister, Connie, to join the agency after graduating from Central Michigan University in 1978. The fourth generation of the family works in the office, along with many other dedicated professionals.